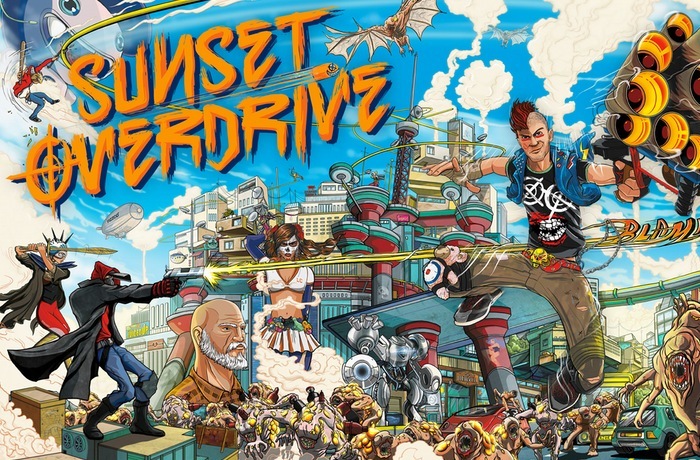 Insomniac Games have this week released two new trailers for the upcoming new Xbox One game Sunset Overdrive, which will be officially launching later this year on October 28th exclusively for the next-generation Microsoft Xbox One console. During the E3 game developers conference in Los Angeles earlier this year Microsoft unveiled a first look at the new Sunset Overdrive’s co-op multiplayer game. Playing as a FizzCo employee players are tasked with cleaning up the mess in the aftermath of a celebration to launch their new energy drink, Overcharge Delirium XT. Sunset Overdrive is a stylised open-world shooter in Sunset City during 2027, filled with unique weapons and crazed foes to contend with, check out the intro movie for the game together with some gameplay footage to whet your appetite below. “Choose Your Chaos Wisely – The amount of Chaos is what determines the difficulty of your team’s final Night Defense. The higher your Chaos– the tougher your Night Defense is going to be, but you’ll get more chances to receive cool rewards at the end.